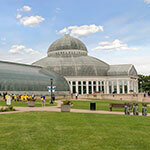 The family-friendly Como neighborhood’s most famous feature is Como Park whose amenities neighbors enjoy all year round. While predominantly residential. the neighborhood is just a short bike ride to a small mall that has a grocery, drug, and liquor store as well as several restaurants and services. There are also two local coffee shops that serve as a neighborhood gathering spot. Our location makes it easy and convenient to get to both downtowns via public transit or driving. The city of Saint Paul purchased land around Como Lake in 1873, hoping to preserve its natural beauty as a public park. The park’s historic grounds and many buildings were built throughout the early 1900s – 1930s with new additions throughout the years (e.g. the Japanese Garden was installed in 1979, the visitors center in 2005.) In the 1880s, residential development followed the improved public transit to the area (first a train station, then a street car that travelled via Como Avenue to both downtown Saint Paul and then Minneapolis) and clustered around the lake, ultimately spreading outward into what was once farmland. Como has a range of housing styles—ranging from large, Victorian-era homes around the lake to smaller one-and-a-half story homes from the 1920s throughout the neighborhood. Ranch style homes from the 1950s can also be found in the neighborhood. For more information on Saint Paul schools, visit Live MSP's Schools page. Naturally bordered by the scenic and winding Mississippi River, Highland Park is centrally located in the Twin Cities and yet boasts it’s own small-town feel. The Village, a shopping district with plenty of restaurants, boutiques, and beautiful public gardens, is in the heart of the Highland Park neighborhood. Families thrive on the recreational opportunities with miles of park land, golf, little league, a movie theater and a newly renovated park pavilion. Walking quaint, tree lined streets to kindergarten or graduate school, the public library or church, or to The Village for its annual 3 day festival, Highlandfest, there's something for everyone to enjoy in Highland Park. When settlers first came to Fort Snelling in the 1830s, Highland Park was the land on which they stayed. It remained farm country until the arrival of the Ford Plant in 1924 and the first major development of the Highland Manor and the Highland Village apartments were opened in October of 1939 at the intersection of Cleveland and Ford Parkway. By 1951, the Village shopping area had burned twice but had been redeveloped with Highland Park State Bank, Powers Dept Store, the Highland Theatre, and an Applebaums grocery store. With the growth of the business community came the housing boom for most of Highland Park. Highland Park consists mostly of single-family houses dating from the 1920s and 30s in many period-revival styles as well as many homes from the 1950s and later in ranch, split-level, and rambler styles. Apartments and condominiums are primarily located in the West 7th Street-Shepard Road area. The Macalester (Mac) -Groveland neighborhood in western Saint Paul extends east from the Mississippi River to the Summit Hill neighborhood. The neighborhood is a rich mix of single family homes with corner stores and vibrant commercial corridors. The Summit Avenue Historic District, with magnificent mansions from the late 1800s, flanks the northern border of the neighborhood. In recent years Grand Avenue has developed into a nationally recognized commercial street, with a mixture of national retailers and local vendors. An abundance of colleges and universities, including the University of St. Thomas, Macalester College, and Saint Catherine University, have made this neighborhood their home. The influence of academia and college-life is felt throughout the neighborhood, offering residents an array of cultural, athletic, and musical opportunities. Scenic pedestrian and bicycle trails stretch throughout Mac-Groveland, in particular along the Mississippi riverfront. Until the 1850s, the area now known as Macalester-Groveland was a part of Fort Snelling Military Base and was restricted from development. Many farms and orchards were established when the land was sold for development in 1854, but in the 1880s several developments occurred making the land much more profitable as urban settlements. First, the Short Line Railroad was built and connected St. Paul and Minneapolis. 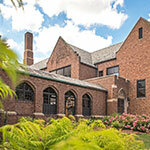 Shortly after, in 1884, Macalester College moved to its current location on Snelling Avenue. Lastly, in 1887 St. Paul began purchasing land along the Mississippi River as permanent public open space. Aided by the expansion of the streetcar system, a residential building boom occurred in the first two decades of the 20th Century, and by 1930 the neighborhood existed almost completely as it does today. Single-family homes in Mac-Groveland neighborhood are designed in a variety of architectural styles found in Saint Paul between the 1880s and the 1920s, including Queen Anne, Craftsman Bungalows, Prairie, Colonial Revivals, and Tudor Revivals. Many pre-war apartment buildings can be found in the neighborhood as well. Sidewalks and trees line either side of the quieter residential streets. Alleys are common throughout the neighborhood with garages hidden behind homes. For more information on Minneapolis schools, visit Live MSP's Schools page. The Summit Hill neighborhood (sometimes referred to as Crocus Hill) is a historic and vibrant community of homeowners, renters and the thriving East Grand Avenue strip of locally and nationally owned stores, restaurants, galleries and other businesses. 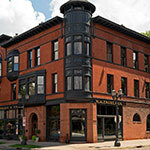 Well-preserved Victorian-era dwellings and other historic architectural treasures are located throughout this nationally famous area of St. Paul (Summit Avenue was recently named one of America’s 10 Great Streets by the American Planning Association.) 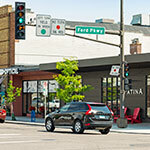 The pedestrian-friendly character of the neighborhood, combined with social and business networks operating throughout the neighborhood and along Grand Avenue, create a feeling of community and belonging. North: Summit Avenue & Ramsey St.
Zip codes: 55105 and 55102. Summit Hill possesses one of the nation's best preserved stock of Victorian-era dwellings along with other classical styles of homes. Apartment buildings and town homes complementing these styles of dwellings are also located throughout the neighborhood. Downtown St. Paul is not only an arts, entertainment, and business hub, but is also home to over 8,000 residents who enjoy living in close proximity to the Mississippi River, Rice and Mears Parks, and the community festivals that inhabit them every season. One of St. Paul’s fastest growing neighborhoods, Lowertown boasts historic buildings, a vibrant arts community, and the popular St. Paul Farmers’ Market. All downtown residents are within minutes of every part of the Twin Cities with easy access provided by I-94 and 35-E as well as most of the bus lines serving the region (and Light Rail Transit coming soon!). The neighborhoods are also connected by the skyway system allowing convenient access to restaurants, retail stores, nightlife, theaters, and more. Zip codes: 55101 and 55102. Pigs Eye Parrant set up a small business downtown after being evicted from Fort Snelling in the 1840’s and we haven’t done too shabby since then. In the 19th century, Lowertown was the major manufacturing and distribution center of Minnesota and the sturdy brick buildings built then are still with us, converted into residential housing. From Pigs Eye to the present day, the history of downtown St. Paul has shaped the history of Minnesota. Homes in downtown include old warehouses and commercial spaces converted into modern apartments and lofts as well as open, spacious artist studios. New high-rise condominium developments offer residents fabulous views of the river and our State Capitol. The Wacouta Commons neighborhood is home to newly constructed condominiums and lofts located around a central park in area that was once filled with parking lots and printing businesses. A walk down 4th street from Wabasha to Broadway is a tour through 19th century architecture, and this range in housing styles mirrors the range of people who are drawn to live here. 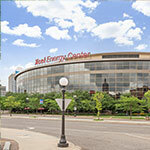 Specializing in St. Paul, but servicing most areas of the Twin Cities, Tim and his preferred partners will work with you to make sure you have a smooth, hassle free experience. No matter the location of property, our expertise, market knowledge, financial acumen and design capabilities will provide you with the results you deserve.